Those of you who keep track of the bylines on our posts might have noticed that my name hasn’t been showing up very often. Though one of our motivations for moving to the country was to improve our work-life balance, the low cost of living here means nothing without a roof over our heads. Even with the awesome deals we’ve found on Craigslist and the Habitat for Humanity store, building supplies aren’t cheap. So in August, I accepted a teaching job at one of the local districts. It’s a challenge being back in the classroom after three years, but a good one. I love my students and my school, and it’s exciting to put some of the things I learned through my research career into practice. However, between grading and planning, much of a teacher’s work takes place outside of the school day. Ironically, I’m working far more hours out in the country than I did with my mostly-remote research job in Seattle. It’s good work, though, and that makes a difference. Working on the cabbage is also good work, although of a very different nature. I still feel mostly incompetent when it comes to construction, although my skill set has grown in leaps and bounds. I’ve learned how to wire an outlet and how to hang insulation. 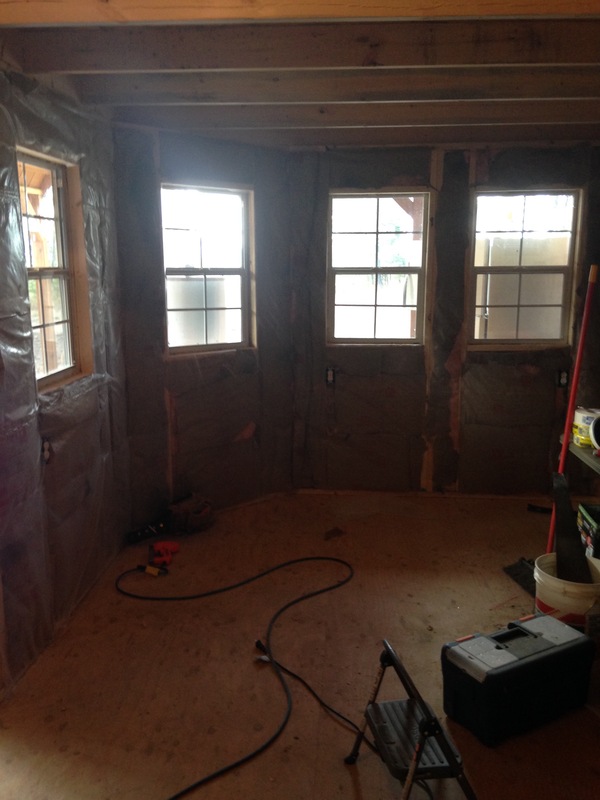 “It’s hard to mess up insulation,” I told Steve, when he complimented me on my work. Our future living room, now with outlets, insulation, and plastic. So my life now consists mostly of teaching and construction work, punctuated by occasional trips to the hardware store. It doesn’t leave a lot of time for blogging, or for my other numerous hobbies, although I have managed to squeeze all sorts of surprising deaths in Long Live the Queen, my new favorite game. It’s a lot of work (and courtly intrigue), but it’s good work. And since, unlike my mom, I’ve never been accused of working too hard, I figure that it’s probably good for me. Good to hear you are back in the classroom Mindy! We need more teachers like you. “Doing” is really hard work – teaching, farming, constructing, cooking, etc. Researching, governing, consulting, counting, – essentially keeping track of what people do or being the “expert” and other folks telling them how to do it takes less time is often described as boring. The hard part of DOERS work is collecting all the data and complying with all the rules made by the NON-DOERS. Great thoughts, Diane! Doing is definitely harder in a lot of ways, while at the same time, it is often more satisfying. At the same time, though, there is so much benefit to learning from experts and fine-tuning any craft. Maybe the trick is to keep balance between the doing and the learning, and occasionally take a brief sabbatical to become an expert yourself!